I haven't tried the new OPI Liquid Sand polish formula yet, and to be honest, I'm not sure I will. It looks gorgeous on pictures, but I don't think I'd actually enjoy wearing something so grainy and matte. I did, however, buy one of the two textured glitters that China Glazed released last summer for their fall On Safari collection. Now I hear the brand is coming up soon with a collection called Texture, and I can only hope that the new shades will look like this one! It took me some time, but I finally tested I Herd That! I thought it would fit in perfectly for the holidays, and I wore it for new year's eve. I Herd That is unlike any polish I had tried before: it's a transparent base absolutely packed with glitters, so much that it looks opaque in 2 coats. On the full sun pictures here, you can see my natural nail through the polish, but that's something only my camera captured. 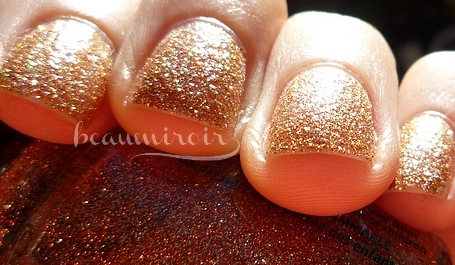 The glitters are golden, coppery, and some of them seem to be holographic. They're all about the same, very small size, which is how you get such an even layer of glitters on your nail without having to place them with the brush. It's quite easy to apply, and it dries down fast to a matte, grainy finish. It's not harsh like sandpaper, but it doesn't feel smooth. Let me tell you, this baby drinks top coat for breakfast! I tried to add a layer of top coat (Sally Hansen Insta Dry) to get a smoother, glossy finish, and you couldn't even tell the difference! I suspect you need multiple layers, or a very thick top coat (Sèche maybe?) to actually cover the texture and have a shiny finish. I was happy with the matte look so I didn't bother. This shade is very warm, and the fact that it's matte keeps it fairly subtle rather than super sparkly. It didn't last long on my nails unfortunately, it started chipping on the second day (which is below average but not extraordinarily short wear time for me). You can see a chip on my pinkie! Overall, I recommend this unique, fun shade if you want to try textured polish but are not too sure about the very gritty look of Liquid Sand by OPI. I agree - I suspect I'll be passing on the sand formulas. This color though is so tempting... absolutely beautiful! The Liquid Sands look cool and edgy but... not for me! It is, indeed, a very warm shade. I hesitated between this one and I'm Not Lion, the other glitter in the collection, which is a much more neutral light gold/silver/champagne, but the store only had this one left! I think it might be too warm for someone with very strong cool undertones. This is gorgeous gorgeous gorgeous! I've really been loving densely packed glitter polishes like this lately--namely Essie's Beyond Cozy from the Winter 2012 collection. I MUST check this one out and also curious about the OPI liquid sand now--I hadn't heard of it! I have a problem with Essie... I ended up returning or giving away all the polishes from them that I tried! So I didn't even take a look at Beyond Cozy when it came out. I need to check it out now! You'll find plenty of OPI Liquid Sand swatches online. I'm curious about what you'll think of them!